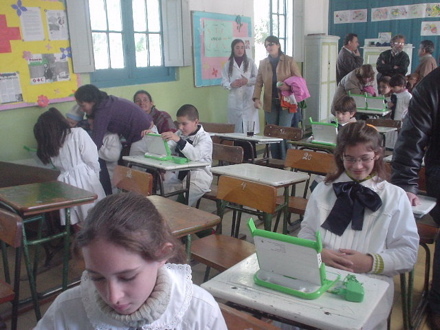 OLPC has just been awarded an order from Plan Ceibal for 90,000 XO's for teenagers in Uruguay. Yes, there will be a new XO specially for teenagers. Uruguay already has 380,000 of the original XOs for younger children, and now the kids can graduate to one designed for them as they mature. It's to be a dual boot laptop. Note not triple boot. No Microsoft in this picture at all. GNOME has leaped into the pool to help out. The press release says, "It will feature the learning-focused Sugar user interface together with the Gnome Desktop Environment to provide a dual-boot Linux operating system with office productivity tools." I wish I were a teenager in Uruguay so I could have one. If they do the partner program, I'm in. It has a larger keyboard, larger keys than the XO for little kids, different colors, and it will come with specialized learning programs for older children. It has a rugged surface still, will be faster than the earlier XO, will use 3 times less electricity than usual laptops, and it can be powered by alternate sources like solar panels. It ships in September. OLPC lives. You see? Even with Microsoft and Intel in the picture and some tacks strewn on the roadway, you can't kill off a project that's FOSS-supported. The code is out there, volunteers will continue to work on it regardless of what the Big Boys pay for, despite all the nay-saying in the media, even bogo-lawsuits, and in the end, it moves forward if there is a real need for the project. I really commend Sugar for the role it has been playing. Do you remember that adorable picture of the little girl who got her XO in Uruguay? I never forgot her grin or her bow tie. This announcement, I hope and trust, means that she can graduate to the high school version in due time. MIAMI--(BUSINESS WIRE)--One Laptop per Child (OLPC), a nonprofit organization whose mission is to help provide every child in the world access to a modern education, has been awarded a bid by Plan Ceibal to provide 90,000 XO laptops for high school students in Uruguay. This is the first time the OLPC XO laptops have been specifically designed for high school-aged students and represents a major expansion in the learning program that will have a global impact. Plan Ceibal has provided a connected laptop to every primary school student in Uruguay with 380,000 XOs and will now begin to expand the highly successful One Laptop per Child program to its high schools. The XO high school laptop (XO HS) has the same industrial design as the original XO 1.0. Based on a VIA processor, it will provide 2X the speed of the XO 1.0, 4X DRAM memory and 4X FLASH memory. The XO high school laptop is designed with a larger keyboard better suited to the larger hands and fingers of older students. It will feature the learning-focused Sugar user interface together with the Gnome Desktop Environment to provide a dual-boot Linux operating system with office productivity tools. The XO HS laptops will be delivered with age-appropriate learning programs adapted to the scholastic needs of secondary schools. A new color variation for the laptop’s case will be an option for the high school model. The XO has been designed to work in the places that need it the most. It has a rugged surface which makes it well-suited for remote classrooms and daily transportation between home and school, uses three times less electricity than other laptops and can be powered by alternate sources like solar panels. Deliveries of the XO high school edition laptops will begin in September 2010. One Laptop per Child (OLPC at http://www.laptop.org) is a non-profit organization created by Nicholas Negroponte and others from the MIT Media Lab to design, manufacture and distribute laptop computers that are inexpensive enough to provide every child in the world access to knowledge and modern forms of education. ASUNCION, Paraguay, June 14 /PRNewswire/ -- Sugar Labs, the GNOME Free Desktop Project, and One Laptop per Child (OLPC) have announced an update to the software offered on the OLPC XO-1.5. The 1.5 million children already using Sugar on the original XO-1 can also benefit from the update, since Paraguay Educa has backported the software. The Sugar Learning Platform promotes collaborative learning through child-friendly Activities that encourage critical thinking. The GNOME free desktop is a hallmark of all major GNU/Linux distributions, suitable for older children and grown-ups. Switching between the two environments takes only a single click. With GNOME on the XO laptop, the door is opened to thousands of additional educational and productivity applications. The XO-1.5 has the same industrial design as the original XO-1. Based on a VIA processor, it provides 2x the speed of the XO-1, 4x DRAM memory, and 4x FLASH memory. OLPC has announced the availability of a high-school edition of the XO-1.5, the XO-HS, with a newly designed keyboard, more comfortable for older students. The first deployment of the XO-HS is set to begin in Uruguay under the highly successful Plan Ceibal in September. Children familiar with the XO-1 will naturally grow into the XO-1.5 with its expanded functionality. "One Laptop per Child promotes open-source software so that it can grow and adapt to the needs of the child. The Sugar platform on the XO is key to our educational mission because it gives students a unique and intuitive learning software environment," said OLPC Association CEO Rodrigo Arboleda. Stormy Peters, Executive Director of the GNOME Foundation, said, "We're really excited to be working with Sugar and OLPC to provide desktop software to children of all ages. GNOME's mission is to provide a free desktop accessible to everyone. Children from Uruguay to Ghana will be able to use their XOs to learn and to show their friends and families how to use Sugar and GNOME." Walter Bender, Executive Director of Sugar Labs, said, "The fluidity of movement between the two desktops gives learners the ability to transition from a learning environment - Sugar - to a production and productivity environment - GNOME. They have the means of honing the creative skills acquired in an elementary education setting into entrepreneurial skills in a secondary education setting." "Sugar on a Stick" allows children who don't have an XO laptop to benefit from this new software. Available for download from Sugar Labs in the new, v3 Mirabelle flavor, it can be loaded onto an ordinary USB thumbdrive and used to start a PC in Sugar without touching the hard disk. The XO laptops and Sugar on a Stick run Fedora GNU/Linux.